DARPA has narrowed the potential launch locations for the DARPA Launch Challenge to eight, with options for both vertical and horizontal launch. 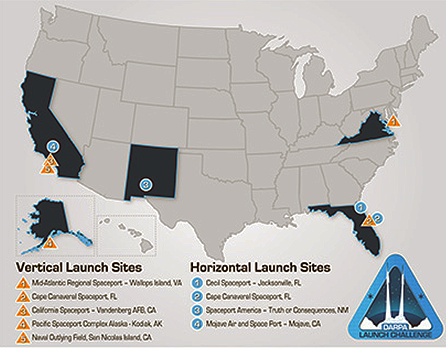 DARPA has selected eight potential U.S. launch locations for the DARPA Launch Challenge. Click on image below for high-resolution. Image is courtesy of DARPA. The challenge will culminate in late 2019 with two separate launches to LEO within weeks of each other from two different sites. Competitors will receive information about the final launch sites, payloads, and targeted orbit in the weeks prior to each launch. Eighteen teams have pre-qualified to participate in the challenge, passing the first hurdle in the milestone process by proposing a viable solution for flexible and responsive launch. The diverse pool of applicants reflects the growth of the small commercial launch industry, and its potential to support emerging national security needs. To successfully pass the qualification phase, potential competitors must complete three discrete applications. Potential competitors submitted pre-qualification applications in mid-October, and the DARPA Launch Challenge application is due by November 30. Teams also must submit and receive acceptance of an FAA license application by February 1, 2019. Todd Master, program manager for the Launch Challenge in DARPA’s Tactical Technology Office, stated that response from teams with different ways of achieving flexible and responsive launch solutions on short notice has been tremendous. The different approaches to technologies used, launch requirements, fuel use, and teaming are a testament to the evolving space community.